A healthy mind needs physical sustenance to grow and thrive. 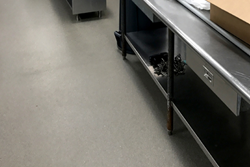 Seton Hall University required new flooring in their main kitchen on campus so students and staff could continue to ‘fuel’ their path to knowledge. Altro Flooring provides safety, durability and helps maintain cleanliness in commercial kitchen environments. The Gillespie Group, a veteran NJ-based commercial flooring company, along with a leading academic facilities contracting company, completed a 6,300-square foot flooring installation to help continue daily college dining routines. The Gillespie Group was selected because of the contractor with whom they had partnered with previously. They knew the job would be completed in the allotted timeframe—and that accelerated schedules meant a very quick turn-around time was required. The Gillespie Group had successfully completed four previous projects on the Seton Hall campus, so there was a strong familiarity with the logistics involved. The project consisted of two phases that were required in order to accommodate the largest incoming freshman class in Seton Hall’s history: first was the kitchen, and second was a new building addition (Mannington in the dining hall). The main dining hall kitchen for students is in the Student Center, which houses the main kitchen on campus, a 6300-square-foot-space. The Gillespie Group worked closely with their contractor partner as part of a complete renovation of the main campus kitchen area. The timelines were aggressive, as the project needed to be complete before students returned to campus from summer break. The schedule was tight: only one month, with overtime each day, and every Saturday to complete the scope. The university itself was behind on schedule and still required the deadline be met. A product recommendation was quickly chosen, based upon The Gillespie Group’s experience with similar environments where food handling, combined with heavy foot traffic, was also coupled with a concern for safety and cleanliness. Altro, for both the walls and flooring was the brand of choice, particularly because of its hygienic properties. The new flooring also needed to be low-maintenance and have slip-resistant qualities. Altro products are especially well suited for environments that must be kept in a highly clean, bacteria-free state, and be easy to clean, with minimum maintenance. Altro proved to be the ideal choice for both the floors and walls. Previously installed Fiberglass Reinforced Plastic (FRP) on the walls consisted of 10-foot wall panels that stretched floor-to-ceiling. The new Altro panels were heat-welded to create a continuous treatment. A vinyl weld between panels that was heated and bonded to both sides of the panel created a seamless surface by using a Turbo Heat Welder. This was the largest Altro project The Gillespie Group completed on a campus setting, utilizing 695 square yards of Altro sheet vinyl flooring with integral base, and 215 Altro Whiterock Wall Panels.